Here at John Mason International Movers, we give thousands of UK residents a ‘down under’ lifestyle every year (We’ve moved over 50,000 people to Australia in our history), so we always take the time to celebrate Australia Day in a special way. 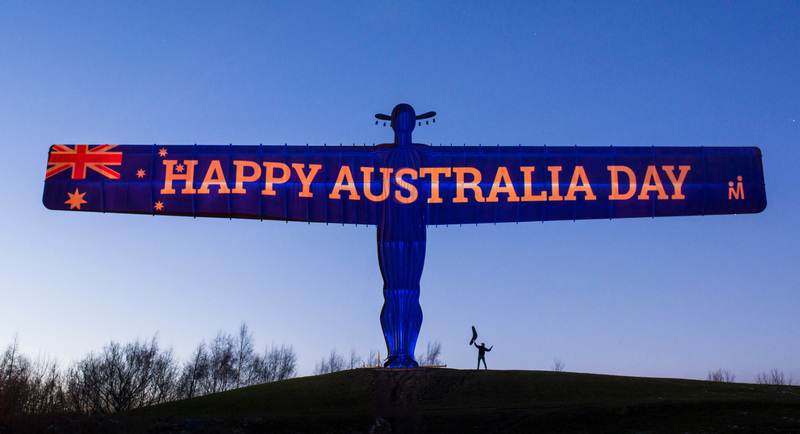 This year is no exception – to mark the bond that exists between the UK and Australia, and to bring celebrations to our home in the north, we decided to hijack the iconic landmark, the Angel of the North. With open arms we wish everyone a Happy Australia Day. LOOKING FOR A LIFE DOWN UNDER? Our team of ten stealthily transported and installed, with a hydraulic mast, a 15.5ft bush hat complete with corks onto the Angel. Projecting images from the ground and filming with drones, we transformed the statue into an epic celebration of Australia Day. Designer of the Angel of the North, Anthony Gormley, has previously spoken out against exploiting the landmark in this way. We've done this because we want to send a message of friendship to the world. We want to put a smile on peoples faces (including Anthony Gormley) and we hope everyone is wowed by our antics. Last year, we took our celebrations to London in the form of letting Crocodile Dundee loose on the streets. Check out the campaign video here.